These vaulted, ornately decorated corridors are called the Brumidi Corridors in honor of Constantino Brumidi, the Italian artist who designed the murals, directed the crew of painters and painted the major scenes and portraits. 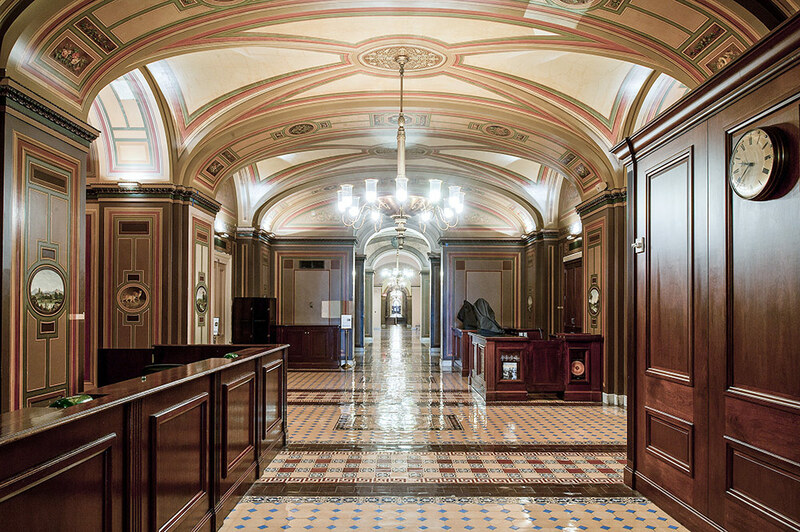 The Brumidi Corridors in the U.S. Capitol Building are part of the Senate (north) wing's first floor. 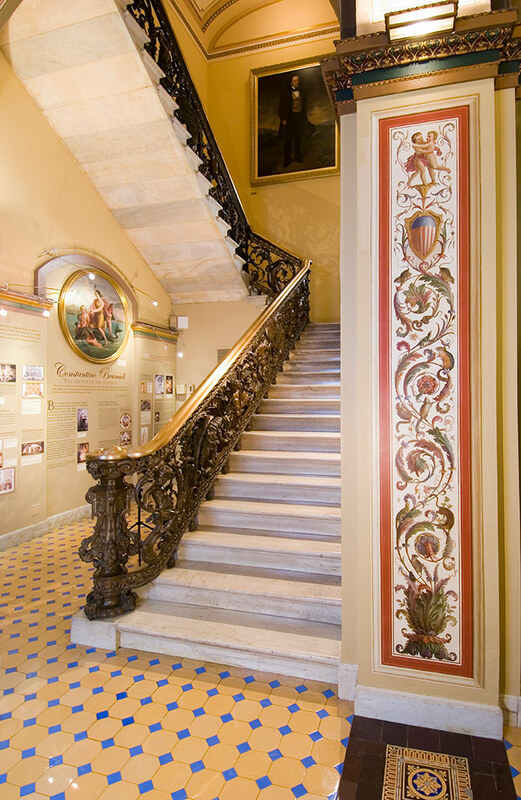 The Brumidi Corridors are part of the wing of the U.S. Capitol constructed by Thomas U. Walter between 1852 and 1859. 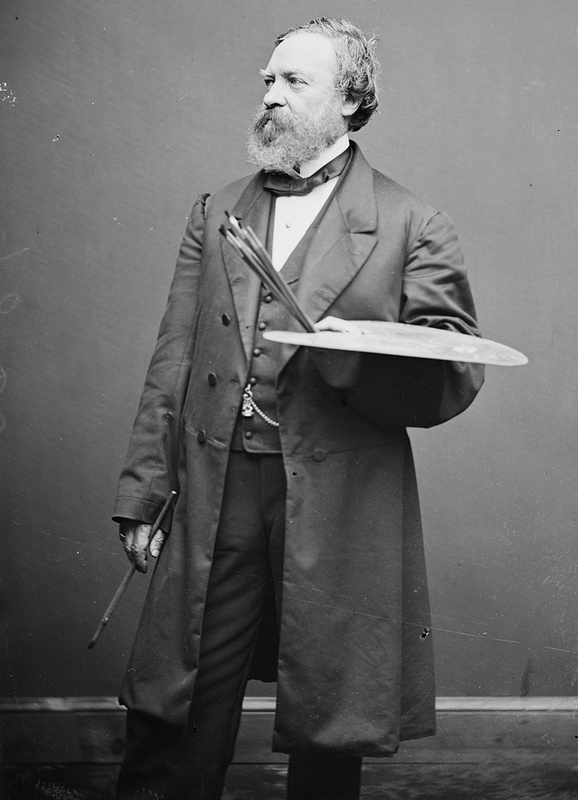 Although Walter had envisioned plain-colored walls hung with a few oil paintings, Superintendent of Construction Captain Montgomery C. Meigs directed Constantino Brumidi to carry out an elaborate decorative scheme based on Raphael's Loggia in the Vatican. Brumidi's classical training in Rome gave him a thorough understanding of ancient Roman, Renaissance and Baroque styles, symbols and techniques of wall painting. He began making designs for the corridors in 1856, and the painting of the walls and ceilings was carried out primarily between 1857 and 1859. Brumidi added details and scenes in the 1860s and painted frescoes in the lunettes over the doorways in the 1870s. Portrait of Brumidi and Raphael's Loggia in the Vatican. Brumidi created the overall design for the corridors and directed its execution by artists of many nationalities. His immediate assistants included Italians Albert Peruchi and Ludwig Odense, Germans Joseph Rakemann and Henry Walther, and an English artist, James Leslie. Leslie is believed to have painted birds and animals and the trophies of musical, marine, agricultural and military implements at the intersection of the north and west corridors and possibly the monochrome lunettes of trophies. The foreman of the decorative painters, who worked in tandem with Brumidi, was the German-born Emmerich Carstens. A variety of painting mediums and techniques were employed in the corridors. Brumidi created the portraits and historical or allegorical scenes in the semicircular lunettes over the doorways in the difficult true fresco technique. The wall decorations were painted by the team of artists and decorative painters in oil mixtures on plaster. Brumidi himself most likely painted the portraits. 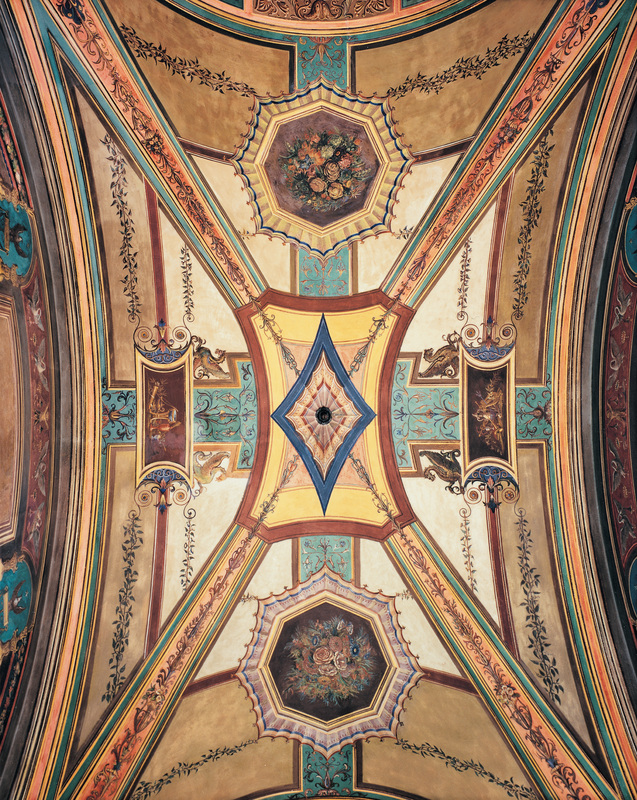 The ceilings were painted in water-soluble tempera, also called distemper. Within the framework of panels framed by illusionistic moldings are symmetrical designs of scrolling vines, vases and mythological and allegorical figures. 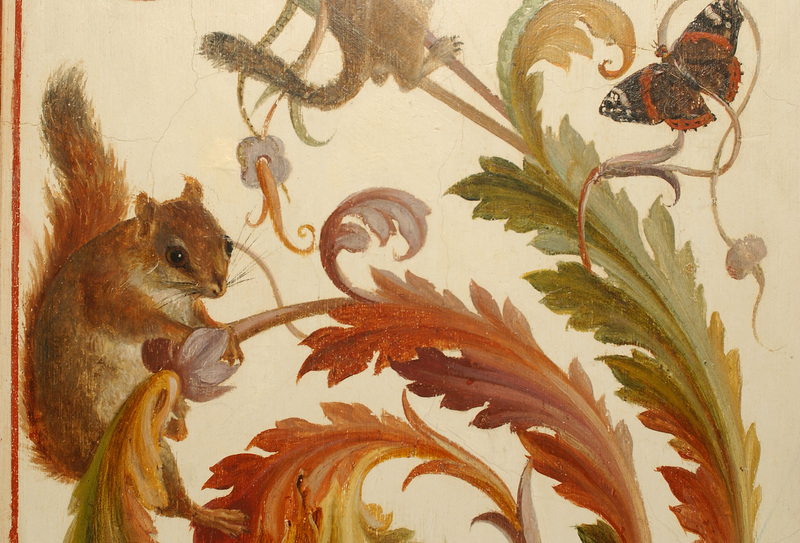 Into these classical motifs Brumidi integrated American flora and fauna. On the intricately decorated walls can be seen an amazing variety of classical gods and goddesses; birds of a hundred different species; rodents, including chipmunks, squirrels and mice; insects and reptiles; and flowers and fruits. On the ceilings are landscapes and agricultural implements interspersed among the colorful framework of ornament. Some elements were added later by undocumented artists, including the impressionist-style oval landscapes in the ceiling. Modern inventions, such as the airplane, were painted on the ceiling in the early twentieth century. Visitors to the U.S. Capitol have long been puzzled by blank ovals in the corridors. Although Brumidi and Meigs intended them to be filled with scenes, they were left empty when the corridors were being painted because of restrictions by Congress, which in 1859 was considering having all fine art in the U.S. Capitol approved by an art commission. Much later, in the 1870s, Brumidi himself was hired to paint scenes in the lunettes over the doorways. Some of the blank areas in the North Corridor have been filled by later artists. Around 1930, an unknown artist portrayed the Wright brothers' airplane and Charles Lindbergh's "Spirit of St. Louis." In 1975, Allyn Cox painted "First Landing on the Moon, 1969." The most recent addition to the corridor is the scene depicting the space shuttle Challenger mission crew, painted by Charles Schmidt in 1987. These last two scenes were painted on canvas and then applied to the wall. One of the bronze stairways in the Brumidi Corridors. 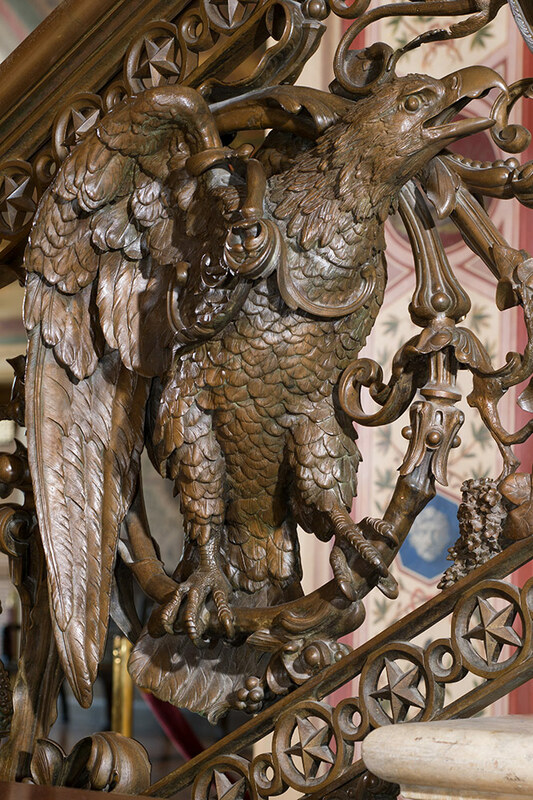 The ornate bronze railing of the stairways used by Senators at either end of the north corridor are composed of cherubs, eagles and deer entwined in leafy rinceaux that echo the wall decoration. They were designed by Brumidi, and Edmond Baudin sculpted them in Philadelphia. Archer, Warner, Miskey & Co. cast them, also in Philadelphia, and they were installed in 1859. Cleaning and conservation in 1988 restored their original antique bronze patina, and conservators cleaned and waxed them in 2014. The ornately patterned and colored tile floors were manufactured by Minton, Hollins & Company in England. They were installed throughout the new extensions between 1856 and 1861. The encaustic tile, made of inlaid colored clays, was chosen for its beauty, durability and rich design, which complement the painted decoration of the corridors. The mural conservation program completed in 2017 allows us to enjoy Brumidi's original designs, which were hidden under overpaint for much of the twentieth century. The Brumidi Corridors are composed of five hallways, known as the main, west, inner, north and patent corridors. The Reception Area of the Brumidi Corridors and an oval medallion found within. Along the north-south Main Corridor in the Reception Area are 14 oval medallions of landscapes painted by Brumidi in 1861 based on scenes published in volume 12 of the "Pacific Railroad Report." In the south corridor eight medallions of animal groups alternate with repeated red, white and blue shields. 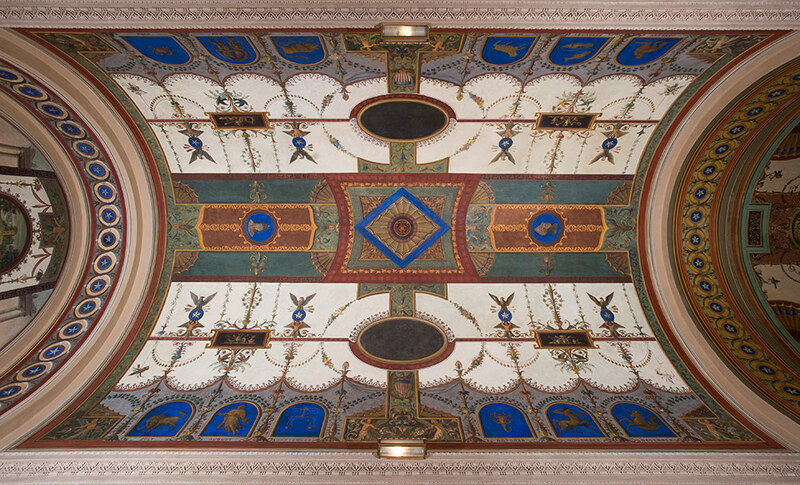 In the area near the refectory leading into the connecting corridor, now called the Trophy Room, is an original tempera ceiling with illusionistic carved eagles and coffers and trophies of military equipment likely painted by James Leslie, who is documented as having painted the trophy panels in S-128. Lunette of Bellona, Roman Goddess of War, in the Brumidi Corridors. The subjects of Brumidi's lunettes over the doorways reflect the functions of the committees that met in the rooms when they were painted between 1873 and 1878. At the end of the West Corridor, over the door to S-131, is "Authority Consults the Written Law," whose subject related to the Senate Committee on the Revision of Laws assigned to the room. "Columbus and the Indian Maiden" and "Bartolomé de Las Casas," who was called the Apostle of the Indians, were painted over the doors of the Senate Committee on Indian Affairs (S-132 and S-133). 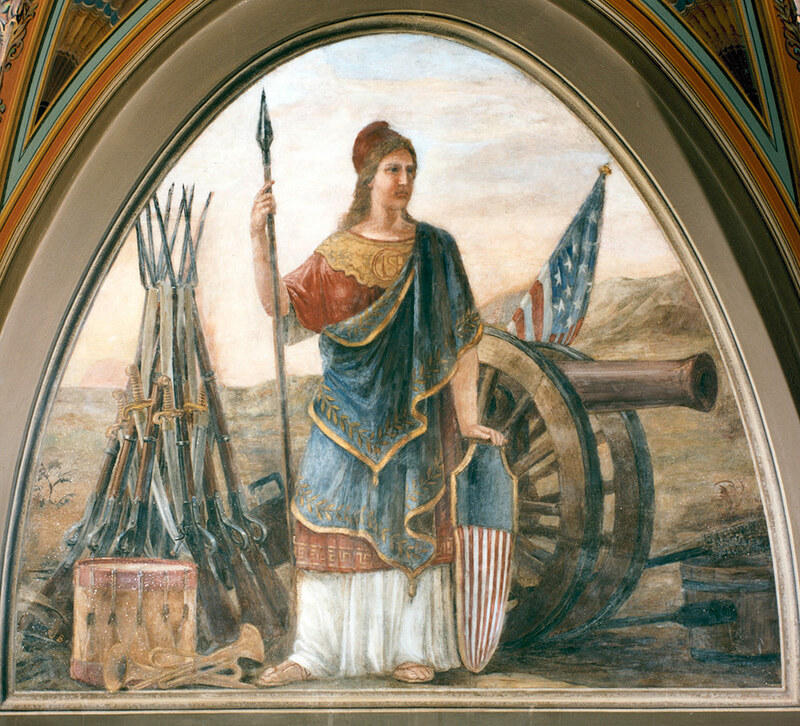 Above the present Senate Committee on Appropriations room (S-128), originally occupied by the Military Affairs Committee, is "Bellona, the Roman Goddess of War." 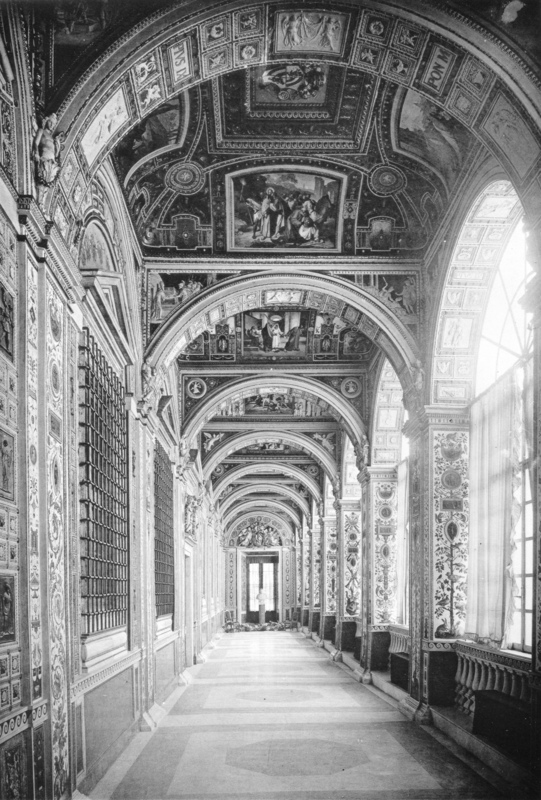 The Zodiac Corridor area of the Brumidi Corridors after conservation. 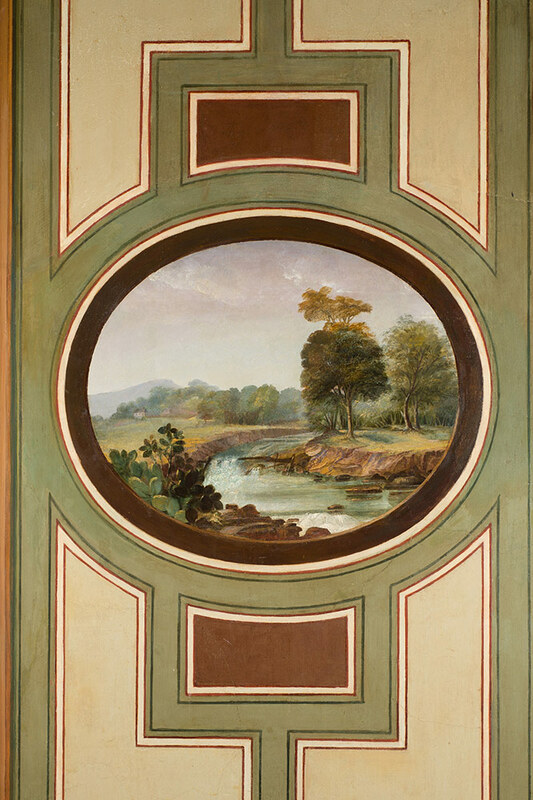 Along the walls in the West Corridor, Brumidi painted monochrome profile portraits of famous early Americans (John Hancock, Francis Hopkinson, Robert Livingston, Roger Sherman, John Jay, Charles Thomson, Charles Carroll and Robert Morris) set in medallions to resemble reliefs carved in stone. In the ceiling at the north end of the corridor, called the Zodiac Corridor, the signs of the zodiac were painted on fields of blue. 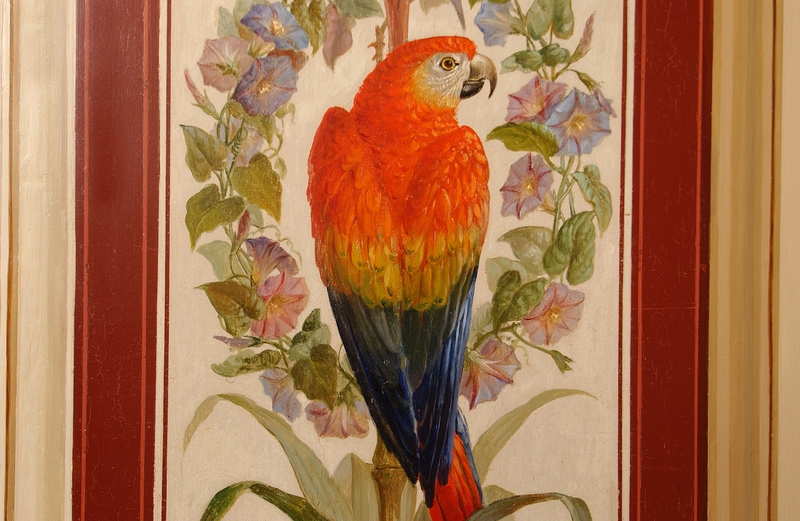 Decorations in the Elevator Corridor, the western end of the North Corridor, include colorful parrots and trophies on the walls. Near the stairways at either end of the North Corridor are pilasters decorated with squirrels and mice. Monochrome medallion portraits of Revolutionary War leaders (Daniel Morgan, Jonathan Trumbull, Horatio Gates, Israel Putnam, Thomas Mifflin, Silas Deane, Richard Montgomery, Joseph Warren, Thomas Jefferson and Benjamin Franklin) are painted along the walls. Over S-124, which was then used by the Senate Committee on Territories, Brumidi painted "The Cession of Louisiana," depicting the meeting of Robert Livingston, James Monroe and the Marquis Barbé-Marbois in 1803. In this area a bronze bust of Cordell Hull and a marble one of Constantino Brumidi by Jimilu Mason, dedicated in 1967, are displayed. Ceiling of the North Entry area in the Brumidi Corridors. The North Entry retains its original tempera ceiling painted by Emmerich Carstens in 1875; Brumidi painted the frescoed portraits of jurists Justice Joseph Story and Chancellor James Kent, and the imitation sculpture bust of Chancellor Robert R. Livingston, in 1878. The area below is decorated with birds; medallions hold scenes of animals and landscapes. The profile portraits of Andrew Jackson, Henry Clay, Daniel Webster and John Adams are different in style and inferior in quality; they are thought to date from the turn of the century. Opposite the entry is a painting of the U.S.S. Constitution by George B. Matthews copied from a 1926 print. At the east end of the North Corridor, over S-118, then occupied by the Senate Committee on Foreign Relations, Brumidi painted "The Signing of the First Treaty of Peace with Great Britain." 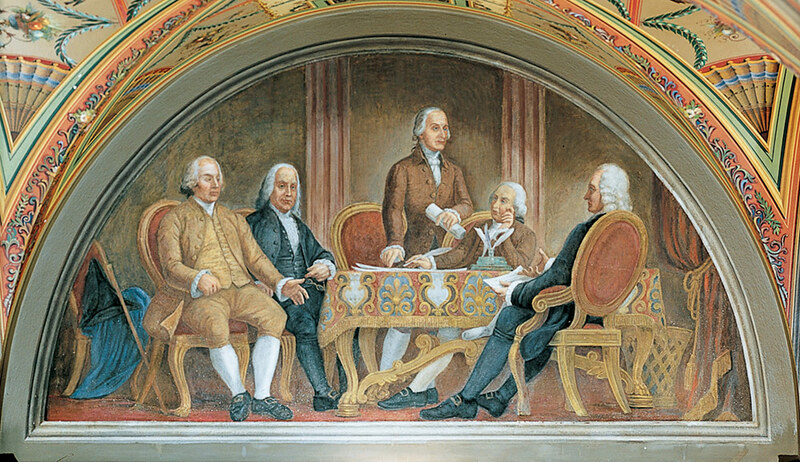 His depiction (seen above) of the 1782 event shows John Adams, Benjamin Franklin, John Jay, Henry Laurens and British representative Richard Oswald and was based on an unfinished sketch by Benjamin West. On the ceiling, plows and other agricultural implements are depicted. 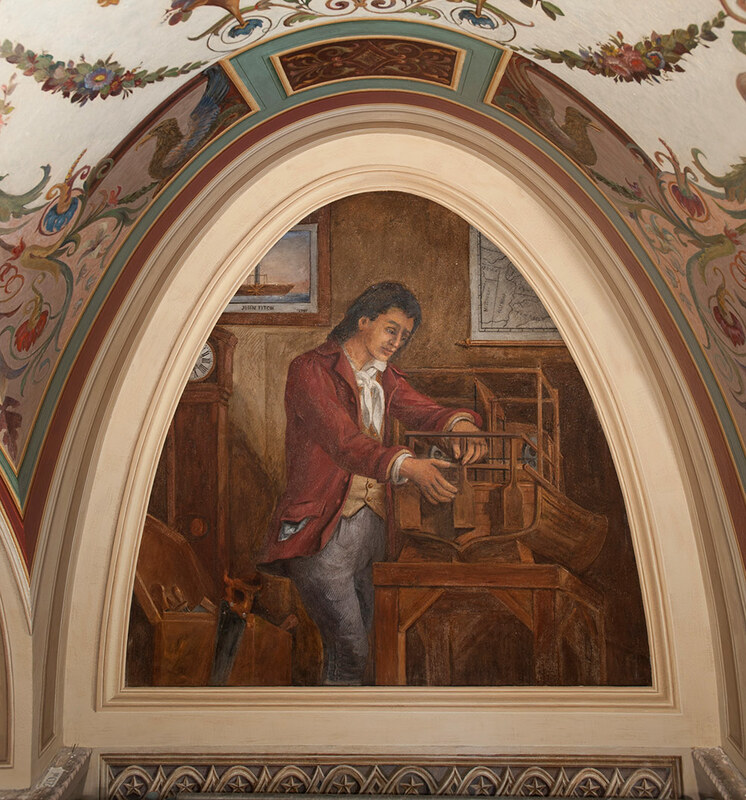 Fresco of John Fitch in the Brumidi Corridors after conservation. The Committee on Patents occupied the room east of the north corridor, now S-116, and the area is still known as the Patent Corridor. Here Brumidi created frescoed lunettes with three important inventors: John Fitch, Benjamin Franklin and Robert Fulton. Appropriately, Franklin appears over the door of the room then assigned to the Committee on Post Offices and Post Roads. On the ceiling are trophies of the arts and sciences.